Tanner De Witt is committed to providing a challenging, rewarding and professional programme for our trainee solicitors. 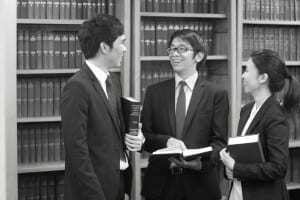 We recruit up to four trainee solicitors each year. From day one a trainee solicitor will be part of a team working on actual cases bringing you into direct contact with clients both in Hong Kong and internationally. Excellent English language is a must; knowledge of Chinese is not essential but is a distinct advantage. Tanner De Witt welcomes both local and overseas applicants who have excelled academically and who ideally have had experience overseas gaining personal development. An offer of a training contract is made subject to first-time successful completion of PCLL. The deadline for 2018 intake trainee solicitors is 31st July 2017. Please send your covering letter, CV and supporting documents including examination transcript (high school and university) to careers@tannerdewitt.com. Applications without transcripts will not be considered. Applications sent directly to partners will not be considered. All applications will be acknowledged within one month. First interview: conducted by the Graduate Recruitment Partner in June. Second interview: conducted by the Graduate Recruitment Partner and another Partner in September and October. You will find being a trainee solicitor at Tanner De Witt Solicitors different from being a student. This is a professional organisation, and you will come into direct contact with our clients. You are not in competition with your fellow trainees. Each trainee brings unique experiences, skills and personality to the firm and will be judged on their own merits. The more you put in, the more you will get out of your two-year training contract. It is up to you to set the pace of your progress. Make sure you are involved in the work of all members of your department, not just the partners. You can learn relevant skills from everybody here, administrative staff and professional staff. Never turn away work — all experience is important. The legal work you experience in any six-month period is determined by the market and not by the firm. Have a realistic expectation of where you should be after six months — don’t expect to be able to do everything that is done in each department. Your expectation in each six-month period should be to progress from being a spectator to being a participant in the work of the department. By the end of the two-year training contract you should be able to decide (i) whether you want to remain in private practice (based upon what you see of the working lives of the more senior solicitors and partners in the firm) or whether you want to move into some other aspect of the legal profession and (ii) whether your character and method of working is more suited to contentious work or non-contentious work. Once those decisions are made it will be easier for you to plan your future. Please remember that the work you are doing now will almost certainly not be the work you are doing in 10 years or even 5 years. All private practice lawyers are constantly adapting to change. Work levels and other factors permitting, the firm would expect to be able to offer successful trainees a position in the firm after qualification. For more information about careers at Tanner De Witt Solicitors please click here.